This little novel is about a woman who discovers a secret about her husband. The book is a literature novel but in my opinion, and definitely towards the end, it becomes more a little thriller. It is a little book you can read within an hour. The tension speeds up a little. It all starts when the couple is walking with their dog in the nearby forest and the dog goes suddenly off-road. They chase their dog and suddenly they stand still near an open space. They discover a digged hole in the forest. In crime series you would expect it to be a grave, but what is it? The end of the book gave the answer and I did not expect that. In this little novel I have found no spelling or grammar mistakes. The main character of the story is the woman Daphne. She has a relationship with Roelof and they have a jack russell terrier named Jackie. On Christmas Day Daphnes sister Ymke, her husband Hans and their three kids come over for a nice dinner. Also a friend of Daphne named Elise and the nephew of Roelof; Martin, come over for the Christmas dinner. 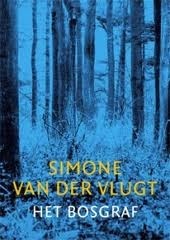 The book is a nice little one to read and it is a nice addition if you have read books of Simone van der Vlugt before. Publisher: Uitgeverij B for Books B.V.